MSF NEFERTITI (MSF Sheikh Habib x MSF Rawa)ALMOST EXTINCT BEDOUIN STRAIN 2001 black bay filly out of Al Khamsa mare, MSF Rawa AHR 584766, & our elite Sheykh Obeyd, Pyramid Society Straight Egyptian Al Khamsa stallion, MSF Sheikh Habib AHR 503970. MSF Rawa is a Kahream daughter. The cross of Kahream daughters bred to MSF Sheikh Habib produce show quality foals, with extreme features, and athletic ability. This filly is a Hamdaniyah - Simriyah Arabian strain. 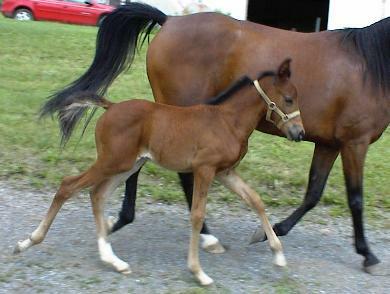 "A" quality halter filly or IAHA Sport Horse. MSF Nefertiti sells with a breeding to one of our stallions in the future for IAHA Sport Horse programs. MSF Aswija 2000 Al Khamsa, Blue List, Egyptian + Syrian Desert + Sa'ud (*Turfa + *Nufoud) red bay Arabian filly with two hind stockings and a front sock. Aswija (Pronounced Ahs-WEE-ja) has beautiful large eyes on a well defined head with a striking marking. Her dam (Rhiannon CHF) is a beautiful flea bitten grey. Rhiannon has outstanding movement and a smooth body which she has passed on to all of her foals. MSF Aswija is a stunning young filly as we watch her float across the paddock. Her sire, (Salil Ibn Iliad), is one of the rare Asil, Blue List, Al Khamsa Arabians of Desert and Sa'udi Arabian (*TURFA &* NUFOUD) + Egyptian sources. Sells with a future breeding to one of our stallions in the future for IAHA Sport Horse programs. MSF HABIBA, AHR 582715 (MSF Sheikh Habib X Alia Gamil Razele) 1998 Extremely well balanced ROSE grey filly with the delicate head of the Moniet El Nefous & Ruminaja Ali bloodline. Her sire, MSF Sheikh Habib is a rare Sheykh Obeyd Straight Egyptian, Al Khamsa and Asil, tracing in tail male line to the 1958 Gleannloch Egyptian import *Soufian (Alaa El Din x Moniet El Nefous). Habiba's dam, Alia Gamil Razele, is high percentage Egyptian of El Hilal, Shaikh Al Badi, *Sammara and Ruminaja Ali plus Babson Egyptian and tracing in tail female to Rollicka (*Hadba tail female)of the CMK breeding. She is started under saddle in Hunter and Competitive Trail and price will increase as training progresses. This filly is qualified as an Egyptian Event "Pyramid Society Egyptian Bred" mare. MSF AMIRA HABIB AHR 584652 (MSF Sheikh Habib X IMF Badia Nafila) 1999 Blood bay Egyptian Bred. MSF Amira Habib has overall correctness, topped with a beautful head and eye, along with the "look at me" attitude. She has a smooth topline, elegance with substance for future Sport Horse breeding programs. She has been showing successfully in IAHA Sport Horse Divison, placing 3-4 against all MATURE Purebred Mares in her classes. She always scores high in movement which is why she scores well in IAHA Sport Horse Division. Her sire (MSF Sheikh Habib) is a rare Sheykh Obeyd Straight Egyptian. MSF AMIRA HABIB sells with a breeding to one of our stallions in the future for IAHA Sport Horse programs. See her 2004 Blood Bay filly, MSF SELMA on the Bedouin Strain page. Dam of MSF EBONY DERBY, Ebonys Doyle LHF AHR 382058 (Ebony Nefous RSI x Larkin De) 1987 Chestnut Al Khamsa, Sheykh Obeyd, Heirloom, is a 50% Doyle/ 50% Pritzlaff Egyptian Arabian mare who has the look of Pritzlaff combined with Doyle Breeding. She the dam of MSF EBONY DERBY & MSF EMIIR, also for sale, to a stallion home. MSF Ebony Derby is a Saqlawi-Jidran of Ibn Sudan strain, in the Pyramid Society Straight Egyptian, Heirloom Egyptian Arabian Al Khamsa group. Ebonys Doyle LHF stands 15.2h and has a beautiful head, large deep heart girth, full hindquarters with substance and bone. MSF Ebony Derby is also going to be tall, & like her dam, and is very typey and elegant. Ask for current pictures. Ebonys Doyle LHF will be expecting an HEIRLOOM SHEYKH OBEYD Egyptian Al Khamsa Arabian foal in APRIL 2005 sired by BLACK stallion, FAYDIN AHR 189737, the lovely and athletic BLACK Straight Babson Egyptian, Pyramid Society Straight Egyptian, HEIRLOOM, Sheykh Obeyd, Al Khamsa, Blue List (eligible) Arabian stallion. MSF NADIIMA AHR pending ( KAHREAM x CRF NADIRA (Jubilee Halima (*Ansata Ibn Halima x Dazeera) X RG Moniette Salim (Alcibiades x RG Sherifa)) Excellent filly to consider for an Heirloom / El Deree Egyptian Arabian breeding program. All horses in the pedigree are Heirloom Egyptian except for the Egyptian stallion, EL DEREE, who was owned by King Farouk, & incorporated in the Egyptian State Breeding Program ( EAO) by General von Szandter in the mid 1930's after King Farouk abdicated the throne of Egypt. We have several Heirloom / El Deree foals for you to consider. We are pleased to have CRF Nadira expecting an HEIRLOOM Sheykh Obeyd Straight Egyptian Al Khamsa Arabian foal in 2003 sired by (RG HILACIOUS AHR 225572), the Heirloom Sheykh Obeyd Pyramid Society Straight Egyptian Arabian stallion. Kahream's blood adds the HEIRLOOM / EL DEREE ( of Inshass Stud ) blood to the 2002 filly pedigree of MSF NADIIMA, MSF EMIIR, MSF JASIIM & MSF NILE KAHREAMA. RASMONET SALIM AHR 578366 (Rasmoniet EHAP x CRF Nadira),TITLES: Blue List (eligible), Al Khamsa, Sheykh Obeyd (SO), Straight Egptian (SE), Pyramid Society (PS), Heirloom (HL) Egyptian strain of Saqlawiyah-Jidraniyah of Ibn Sudan in SO. Rasmonet Salim has an elegant head and beautiful carriage being a FOUNDATION QUALITY mare for a new preservation breeding program. Rasmonet Salim & her dam, CRF NADIRA, are due to the BLACK Straight Babson Egyptian, Pyramid Society Straight Egyptian stallion, FAYDIN, for 2005 HEIRLOOM Sheykh Obeyd Straight Egyptian Al Khamsa Arabian foals in 2005. MSF LADIBUG(Kahream x Lady De Jure) MSF Ladibug IAHA # AA 10165 is a chestnut Anglo-Arabian 2002 filly, showing in IAHA Sport Horse in hand classes. LADIBUG was OVERALL Highest Scoring Half and Anglo Arabian at the IAHA PA Sport Horse show in 2002, over ALL Half & Anglo Arabian entries. She was also shown at other Sport Horse IAHA shows and placed 1st or in the ribbons against ALL MATURE Half/Anglo Arabian Mares. She is elegant in type for an IAHA or USDF Sport Horse in hand show filly in 2004. MSF Abbey Road (King Shamong x Sakhri Star) MSF Abbey Road IAHA # AA 9989 is a bay 2001 Anglo-Arabian filly. Her sire,King Shamong, is a retired 16.1 hh Thoroughbred race stallion, winning 22 races in his 9 year career. She is elegant in type for an IAHA or USDF Sport Horse in hand filly in 2003. Seh will be bred to our Homozygous Black Straight Babson Egyptian Stallion, BW FADL TALI for 2005. MSF SUPERSTISHUN (King Shamong x Alia Gamil Razele) MSF Superstishun IAHA # AA 9987 is an Anglo-Arabian filly. She will be shown in Sporthorse, IAHA, "A" or USDF in hand classes. Her sire,King Shamong, is our retired 16.1 hh Thoroughbred race stallion, winning 22 races in his 9 year career. King Shamong is an elegant and athletic stallion, resembling an Anglo-Arabian in head type. Alia Gamil Razele is extreme in Arabian classic type for producing athletic and beautiful Anglo-Arabians and purebred Trakehners since she passed Trakehner Inspection. She is the dam of Anglo-Arabian stallion, MSF Roadway, MSF Superstishun ( full sibling to MSF Roadway), purebred Trakehner (& 1/2 Arabian) stallion, ALAQ LES MSF and purebred Arabian mare, MSF Habiba. We will retain MSF Superstishun for our Sport Horse Program.Alia Gamil razele will be bred to a Trakehner stallion for 2005 to enter the Trakehner Pilot program. MSF Superstishun will be bred to HOMOZYGOUS BLACK Straight Babson Egyptian Stallion, BW FADL TALI for 2005. MSF GAMILA (King Shamong x IMF BADIA NAFILA) MSF Gamila IAHA # pending is a black bay 2002 Anglo-Arabian filly, ready for showing in IAHA or USDF Sport Horse in hand classes. Her sire, King Shamong, is our retired race Thoroughbred stallion. He retired winning 22 races in his 9 year career. MSF Gamila is elegant in type for an IAHA or USDF Sport Horse. She will be bred to our homozygous Black Straight Babson Egyptian stallion BW FADL TALI for another Anglo Arabian in 2006. Ask for details and current photos. HART ASHEERA AHR 364456 (Rafeer x Nisrs Asha), a Blue List(sublist Basilisk) Al Khamsa Egyptian Arabian mare tracing in tail female to Homer Davenport's 1906 import *Wadduda, the great Bedouin war mare presented to Homer Davenport by the Sultan of Turkey. Asheera has been our daughter's show mare. She has done all kinds of riding activities within 4-H, local shows, 4-H mounted drill team, is a Region 15 IAHA competitive trail winner, winner in pleasure pairs in western tack as well as Open & 4 H hunter. She has had two Arabian geldings, a 1994 chestnut MSF El Sabok AHR 528219, owned by Betty Evans of Fairfield, PA and MSF Rais, a 1997 silver dapple grey gelding, SOLD in 2002 as a YOUTH dressage or hunter IAHA and "A" Open competitor to a 9 year old happy little girl. Asheera had a large and well conformed Anglo-Arabian filly in 2000, MSF COUNTRY LANE IAHA # AA9947, by (King Shamong), a proven & winning race horse. Hart Asheera was inspected and approved by the American Trakehner Association (www.americantrakehner.com) in 2001. HART ASHEERA is listed here as a reference mare only.